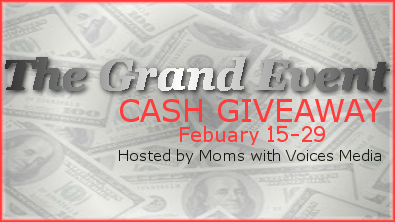 THE GRAND EVENT #GIVEAWAY ~ Blogger Sign Up. Cute-Ecakes and Moms with Voices Media are hosting a Grand Event! (Yes- $1000.00) With a goal of 100 bloggers we are going to make this thing huge!! 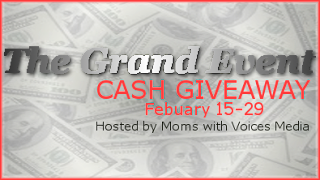 The Grand Event Cash Giveaway will run from Wednesday, February 15th (12:00AM) to Wednesday, February 29th (11:59PM). The actual prize will depend upon participation! Grand Prize amount will be announced on 2/8!! For an added incentive to spread the word, we've added a blogger prize! There are TONS of ways to enter, and I've tried to make it as easy for you as possible! ONE WINNER- will participate in the event for FREE! Find out complete details and sign up HERE!! *If any of my blogger friends sign up for this event please credit Humble Pie (Amy Dell) when asked "Who Referred You?" on the EVENT SIGN UP form. **This post is intended to offer promotion for THE GRAND EVENT GIVEAWAY and offer information to bloggers on how to participate in THE GRAND EVENT GIVEAWAY. Please direct any questions to Cindy at the CUTE-Ecakes site for more details not listed here.